Cite page (MLA): Wisnicki, Adrian S., and Megan Ward. "Manuscript Citation and File Naming Practices." Livingstone Online. Adrian S. Wisnicki and Megan Ward, dirs. University of Maryland Libraries, 2017. Web. http://livingstoneonline.org/uuid/node/05c2bec5-31aa-4dde-b5e9-b3fdff8e3181. The 1870 and 1871 Field Diaries and other texts studied by the Livingstone Spectral Imaging Project can be difficult to cite due to Livingstone’s methods in composing his manuscripts and the complexity of our processed spectral images. This page outlines the standardized system that we have adopted for, first, citing specific manuscript pages and spectral images and, second, naming corresponding spectral image files. The Livingstone Spectral Imaging Project has focused on the following manuscripts: the "Retrospect to be Inserted in the Journal" (10 Mar. 1870), the 1870 Field Diary (17 Aug. 1870-22 Mar. 1871), the 1871 Field Diary (23 Mar.-3 Nov. 1871), and a selection of six 1871 letters (5 Feb.-26 June 1871). Livingstone's practices in composing these texts resulted in a series of manuscripts that today make normalized citation difficult, particularly with the addition of multiple spectral images for each manuscript side. To assist our users, we outline below the standardized system that we have adopted for, first, citing specific manuscript pages and spectral images and, second, naming spectral image files. In the appendices that follow, we provide all necessary supporting information, including overviews of each manuscript; author and date details, page numbers, and project file names for each page of each manuscript; and all processed spectral image names. Bonus: Download a spreadsheet that sets out the relationship of Livingstone’s 1870 Field Diary and select 1870-71 manuscripts to their underlying source texts in detail. We use a standardized citation system when referencing Livingstone’s manuscripts and our spectral images. The system draws on the information set out in the appendices (below). It is shaped by our two different citation practices: we use abbreviated details when citing in our critical essays and other paratextual materials, but include more expansive information when naming corresponding spectral image files. Note: We draw on the relevant entries in our bibliography and, simply, shortened versions of the image numbers used in our digital catalogue but in square brackets (e.g., "0004" becomes "," "0691" becomes "," etc.) when citing the Unyanyembe Journal (1866-72) and the field diaries from Livingstone's last expedition (1866-73). As noted above, the Livingstone Spectral Imaging Project encompasses an assortment of manuscripts from the 1870-71 period. We provide detailed entries for each of the texts in our bibliography. Below we reference those entries using only author and date details. ▲"Retrospect to be Inserted in the Journal" (10 Mar. 1870). The "Retrospect to be Inserted in the Journal" consists of a single manuscript: Livingstone 1870a. The manuscript contains a total of eight pages (two per side of leaf). ▲1870 Field Diary (17 Aug. 1870-22 Mar. 1871). 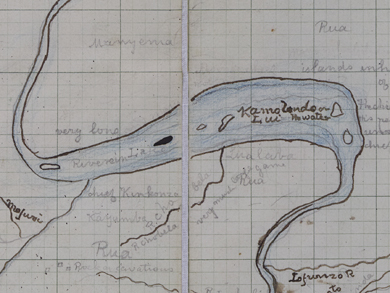 The 1870 Field Diary consists of a series of pages written over diverse undertexts. The pages may be divided by undertexts into gatherings and sub-gatherings (as in our six-part State of the Manuscript essay) or by a combination of undertexts and dates into fragments (as in our bibliography and here): Livingstone 1870b, 1870c, 1870d, 1870e, 1870f, 1870g, 1870h, 1870i, 1870j, 1870k, 1871a, 1871b, and 1871e. The first fragment (Livingstone 1870b) consists of 35 leaves, each of which contains a page on the recto and verso, for a total of 70 pages. The remaining fragments together consist of 41 leaves that contain a total of 96 pages plus a printed map that we have not numbered. There are also two sequences of pages (1870d, 1870g) taken from a transcription of the entire 1870 Field Diary manuscript made by Agnes Livingstone. These pages cover dates missing from the original manuscript pages and may indeed be transcriptions of lost original pages, although the evidence is inconclusive. We have treated these fragments as if they did form part of the original manuscript and include them in the relevant places below. ▲1871 Field Diary (23 Mar.-3 Nov. 1871). The 1871 Field Diary consists of two parts: the main Nyangwe segment (Livingstone 1871f) written across the pages of a single, eight-page issue of The Standard (London) and a fragmentary set of additional diary pages (Livingstone 1871k, 1871l, 1871m) written over various scraps of paper. In creating the Nyangwe segment (1871f), Livingstone cut up the issue of The Standard into 16 smaller leaves, then assembled these into two 32-page "copy-books" (Waller, in Livingstone 1874,2:114n.). In other words, Livingstone composed two diary pages on each side of each leaf for a total of 64 pages. (Note: Livingstone or someone after him further cut one of the original diary leaves into two halves, with the result that there are today 34 folia and so 34 spectral image sets for this segment of the diary, rather than 32 as would be expected). The fragmentary set of additional diary pages consists of three separate items. The first item (1871k) consists of two leaves with two pages on each side for a total of eight pages. The second item (1870k) is a single-leaf fragment. One side has two diary pages, the other just one, for a total of three pages. The last time (1870m) includes two leaves with one page per side for a total of four leaves. ▲1871 Letters (5 Feb.-26 June 1871). The 1871 letters include six separate letters: 1871c, 1871d, 1871g, 1871h, 1871i, and 1871j. The first letter (1871c) consists of two leaves, each of which contains one page per side for a total of four pages. The next three letters (1871d, 1871g, 1871h) consist of one leaf each, each of which has one page per side. The last two letters each occupy one side of the same single leaf. The page numbers below come directly from Livingstone's manuscripts, except those in curly brackets (which we have taken from Agnes Livingstone’s transcription of the 1870 Field Diary) and those in square brackets (which we have supplied). Information regarding overall Livingstone Online file naming practices appears in our Practices, Standards, and Arrangements section and is not reiterated here. We have developed multiple processed spectral images of each side of each leaf of every manuscript included in the present critical edition. We define these processed image types in our Notes on Processed Spectral Images section. Below we offer a simple enumeration of all relevant processed spectral image short and long names.